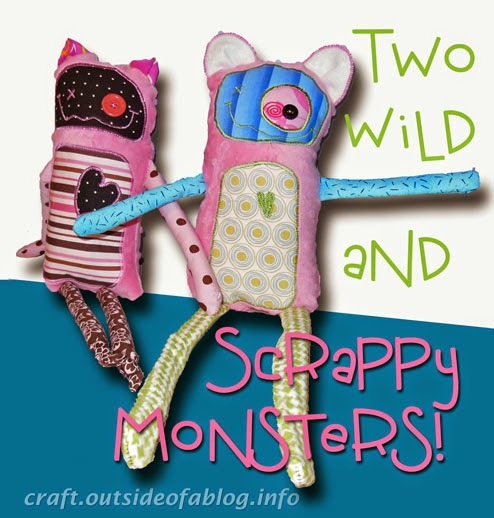 Outside of a Blog: Scrappy Monster Dolls: The Fun! I started with a piece of pink minky, left over from making a taggy lovey (that baby is now 3 years old). I have a basket (hoard) with smaller scraps of cotton prints and flannel; some has fleece fused to it and some of the scraps are already cut in circles—convenient! I laid out the minky and decided on dimensions, then cut it into two sets of rectangles, one for each monster doll. Then I went through the scrap basket and "tried on" different pieces and combinations for face, tummy, arms, legs, and ears. I used some of my precut circles for one monster's eye and for ears for both monsters. I also cut a little heart for one of the monster dolls. When I had combinations I liked, I cut the face and tummy shapes and fused Wonder Under to them. Then I fused faces and tummies to the fronts of the monster pieces. I love to do satin stitch applique. Anyone with a sewing machine that can do a zigzag stitch can do this! I usually set my stitch width to about 3 and adjust the stitch length shorter and shorter until it looks the way I want—close enough for coverage, but not too bulky. I keep (less cute) scraps in a basket by my sewing machine so that I can test stitches and stitching before I sew on my actual project. Now, a satin stitch with regular sewing thread looks good, but I think that using Sulky embroidery thread makes it look special. Yes, the truth is out: I hoard more than fabric and craft supplies, I also have many spools of beautiful, shiny, machine embroidery thread! Oh, yeah, back to the monster dolls. After fusing the tummies and faces to the bodies, I satin stitched the edges. Then I fused and stitched extras, like the heart or eye, and satin stitch those as well. I also used satin stitching to make the X eyes and the wavy mouths. The little green heart is done with free-hand stitching. (Keep the satin stitch settings, drop the feed dogs, and use a darning foot.) Finally, I sewed on the button eyes. Now to finish our little monster dolls. The arms and legs are strips of fabric sewn into tubes. Some are stuffed, the ones sewn from flannel that was fused to fleece are not. The brown and pink legs on one monster have knots tied at the ends to create feet. Once created, pin the arms and legs to the right side of the monster front, raw edge to raw edge. I found it helpful to fold the arms and pin them to the center of the body so they wouldn't get in the way later. To make the ears, I cut two circle shapes in half for each monster. I stitched each "outside ear" half circle to and "inside ear" half circle, then clipped the curves and turned them right side out. I folded a small pleat in the bottom edge of each ear (raw edges), and pinned the ears to the bodies, raw edges together. The "inside" of the ear should be down against the face. I pinned the monster's back to the monster's front, right sides together. I sewed almost all the way around, leaving just enough open to turn them right side out. Istuffed the bodies with fiberfill and hand stitched the openings closed. 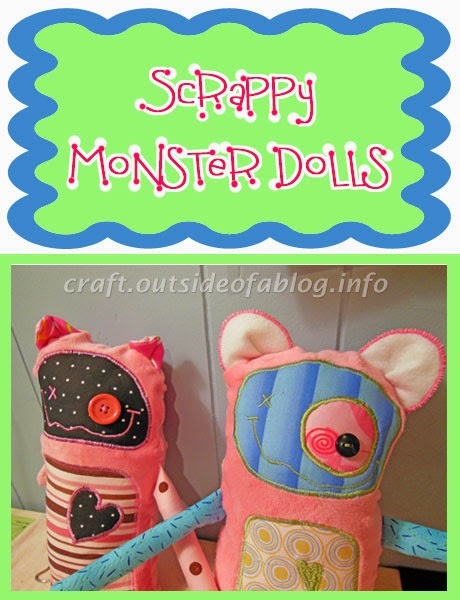 All that's left to do is to find a little monster—or a little doll—who would love to have a scrappy monster doll!